Art honor society graduation cords, in the primary colors of red, yellow, and blue, are worn at graduation to recognize membership in various art programs, organizations, and honor societies. 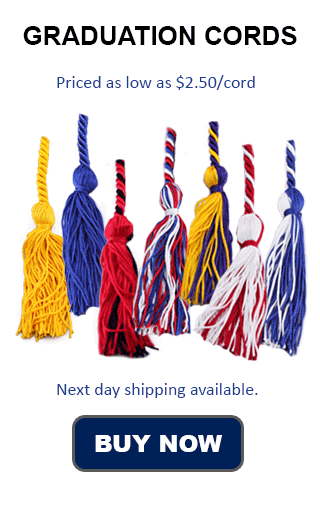 These honor cords are in the primary colors to represent the colors of art and all the colors that can be created using just these three basic colors. There are various levels of the art societies, that, when combined, cover students in high school, middle school, and college. There are even junior societies for middle school students, that is for students grade 7-9. Either way, the art honor society graduation honor cord use is determined by the school from which students will be graduating, and graduates are encouraged to check with their school before making any purchases or decisions about graduation cord use at commencement. Currently there are tens of thousands of students in art honor socieites nationwide.